Our Professional Members welcome you. Hawaii Writers Guild is dedicated to cultural enrichment through use of the written & spoken word. 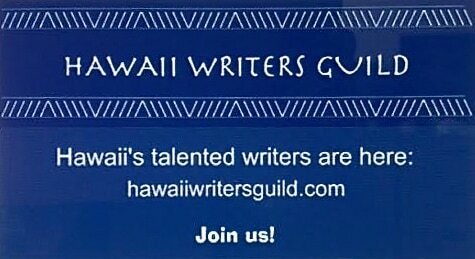 ​​The Hawaii Writers Guild is an independent association of professional writers engaged in the promotion of literacy, cultural enrichment, entertainment, and dispersal of information through the use of the written and spoken word. The Guild’s goals include promotion of artistic awareness and literacy within the general public. The Guild supports the equal rights of all people regardless of race, national origin, sexual orientation, or physical condition. ​​You can get in touch with us easily. Just hit the button below. Interested in helping Hawaii Writers Guild with a donation?